7 hdc x 6 row = 4” (10 cm) square. 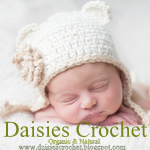 dc – half double crochet, sc – single crochet. 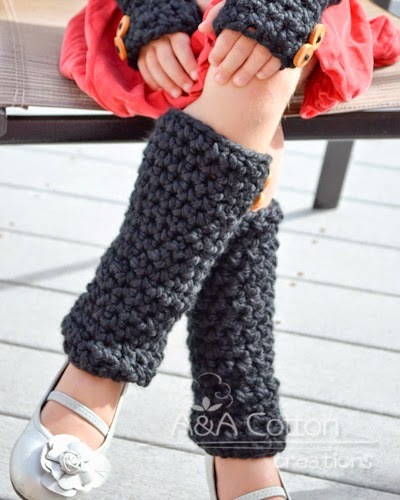 1 skein for toddler size and a little more for children size. ·Loop&Threads Cozy Wool yarn. Super Bulky, Yardage/Meterage:90 yds/82 m, ball weight:4.5 oz/127g. ·Lion Brand Wool-Ease Thick & Quick Yarn. Super Bulky, Yardage/ Meterage:108 yds /98 m, ball weight: 6 oz /170 grams or any other blend of similar yardage yarn. NOTE: The legwarmers are worked in rounds. Note: Check the circumference of the ring, it should be stretched out to 9”(22cm). If it’s bigger or smaller change the size of hook or crochet by a different size. Rnd1-15: Ch2, hdc in all sts around, join with sl st to top of beg ch2 = 15 hdc. You may repeat rnd 15 if you need legwarmers longer. Note: Check the circumference of the ring, it should be stretched out to 10”(25cm). 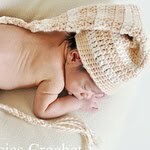 If it’s bigger or smaller change the size of hook or crochet by a different size. Rnd1-18: Ch2, hdc in all sts around, join with sl st to top of beg ch2 = 17 hdc. You may repeat rnd 16 if you need legwarmers longer. Now you can sew on buttons, flowers, any other attachments that you want as well as how many you want. Or you can just leave it without any attachments. Make sure to check matching Cowl and Fingerless Mittens. cute idea as a handmade gift for toddler! They are so pretty! thank you for sharing!